an improved scalp health, increased thickness of existing hair as well as stimulation of new hair growth. Experience zero recovery period and witness visible changes within 30-45 days after the treatment. Book an appointment with L A Skin & Aesthetic Clinic today!! 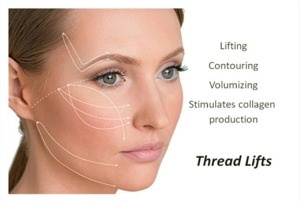 Facial Rejuvenation Treatment has arrived bringing along the good news of giving your face a brand new life! This advanced treatment is constituted of four technologies : Vacuum bubble clean (Hydrafacial), CO2 Geneo, Multipolar RF, and Ultra cosmo. It’s pleasant in approach and one can see instantly visible results post- treatment. We at LA SKIN & Aesthetic Clinic promise to get you rid of the fine lines, facial dehydration, breakouts, dead skin, pigmentation, and various other things that bother you about your face through the one and only ‘Facial Rejuvenation Treatment’. 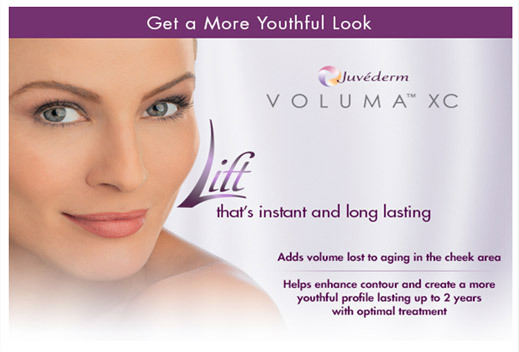 Now available at L A SKIN & AESTHETIC CLINIC ! 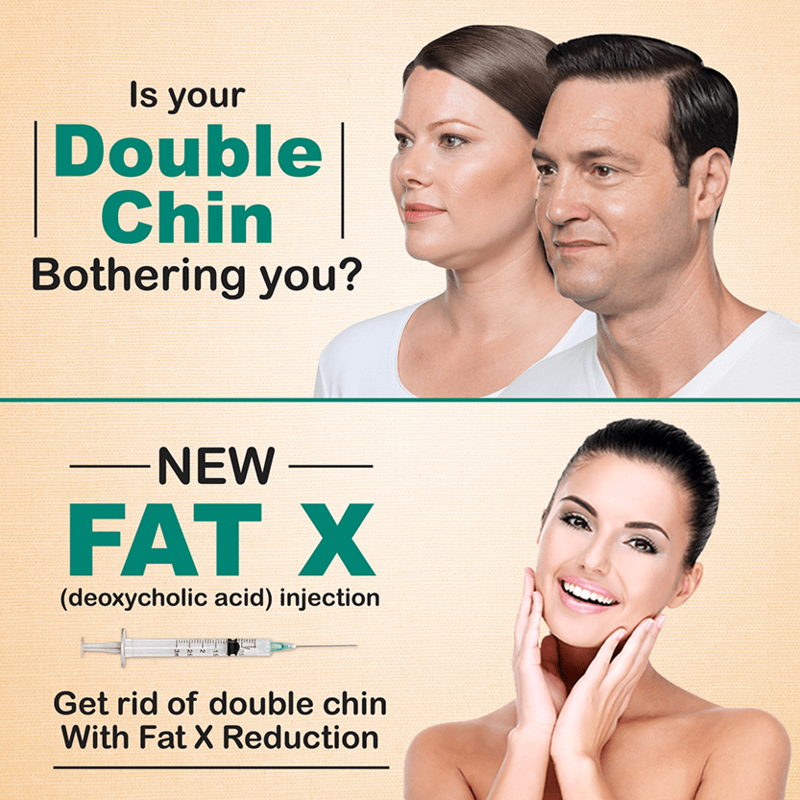 If the fat under your chin is bothering you and you don’t want to go under the knife then Fat X is the treatment you should go for. This non surgical treatment involves injections under the chin and is suitable for people with moderate to severe fat under the skin. This treatment works by dissolving fat cells. It has been clinically proven to be safe and effective as the results start to show in two to four months. 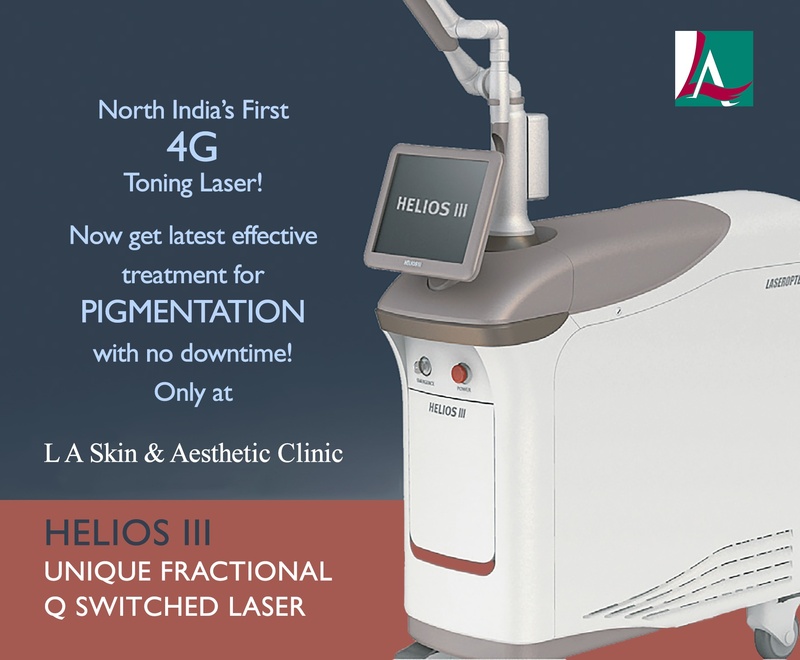 L A Skin & Aesthetic Clinic is proud to announce the launch of the first HELIOS-III laser in North India, which takes the treatment of pigmented lesions to a new level. HELIOS III is the latest, upgraded Q-switch Nd-Yag laser with the newest industry features and technology. The first of its kind with real twin pulse, HELIOS III evens out skin colour and gets rid of pigmentation revealing a bright, fair and flawless skin, also known as Laser Toning. It also stimulates collagen, thus able to shrink pores and reduce wrinkles. Photo damaged skin, melasma, freckles, age spots, tattoos, PIH, Café au lait macules, Nevus of Ota and even toe nail fungus can be treated with great safety. HELIOS III provides faster and more effective laser toning through the use of patented 4G toning technology. The procedure requires multiple sessions of about 15 minutes, 3 to 4 weeks apart. There is an immediate brightness and glow and subsequently the skin tone becomes lightened and even. And the best part about Laser toning is that it is quick, safe, painless, highly effective and has no down time. PRP Treatment involves blood being taken from the patient’s body and centrifuged to separate the serum and platelets. Platelets are then injected to the patient’s treatment area, releasing powerful molecules which have profound biologic effects on hair follicles and skin. This treatment is often referred to as “Dracula” or “Vampire” Therapy. Immediately after the PRP treatment, skin appears visibly smoother and revitalized and lines and wrinkles are visibly reduced. 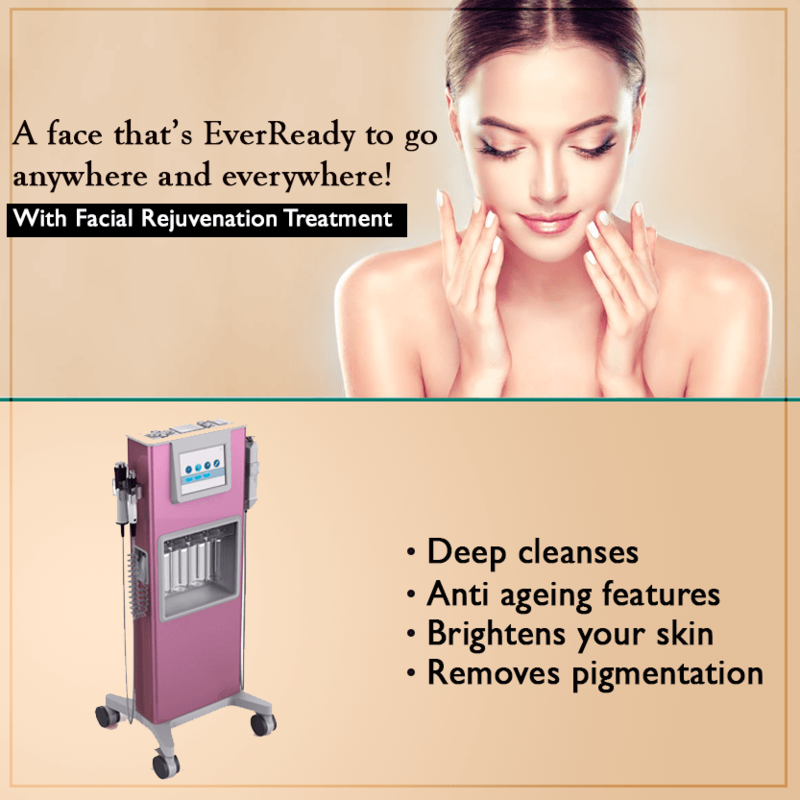 It has been proven to be safe and effective in promoting the natural process of skin rejuvenation and augmentation. It is highly recommended to patients who prefer more natural approach to anti-ageing treatments, as opposed to botox and filler injections. It is also highly effective in improving appearance of fine lines and wrinkles, sagging skin, sun damage, dull/worn out skin. Platelet Rich Plasma (PRP) is also used in hair restoration and is the best treatment available, apart from surgery. It helps to reduce the volume of hair loss and supports regrowth of thinning hair, leading to visibly thicker and fuller scalp.Growth Factors and other components in platelets can stimulate stem cells and rejuvenate hair follicles. 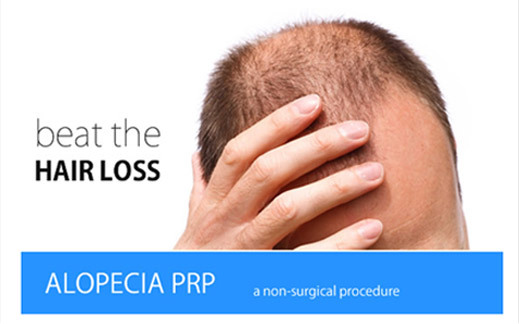 Under comfortable local anesthesia, PRP is painlessly injected into the area of scalp where weak hair follicles exist. Microneedling of the skin is performed immediately following the injection to activate the platelets. The comfortable, outpatient procedure takes less than one hour to perform and patients may resume all activities, including workouts, shampooing, etc. immediately afterwards as there is no recovery phase. Mild soreness and redness of the scalp, if any, resolves in less than a day and improved hair growth can be measured in a matter of weeks. Gives a beautiful smile by improving the folds around the mouth. An effective anti wrinkle facelift and skin tightening procedure that has become very popular due to its safe, fast and effective results. It is an advanced technology where fine threads called polydioxanone (PDO) are inserted into targeted areas under the skin to stimulate skin tissues. As a result, the skin tissues create new tissue fibroblasts and collagen, which produces a tightening effect from inside out. When sagging skin is tightened, it creates a more sculpted ‘V shape’ face as well as smooth, silky skin. Can be applied to anywhere on the body, including the face, eye corners, cheeks, double chin, neck, forehead, laugh lines, forearm and abdomen. It can be used to heighten the nose bridge, giving it a natural elevated look.